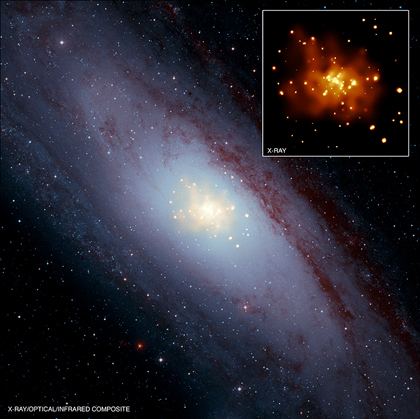 This composite image of M31 (also known as the Andromeda galaxy) shows X-ray data from NASA's Chandra X-ray Observatory in gold, optical data from the Digitized Sky Survey in light blue and infrared data from the Spitzer Space Telescope in red. The Chandra data covers only the central region of M31 as shown in the inset box for the image. The good folks over at Cosmic Variance have blogged about a "Sports Science" segment that analyzes how well (and accurately) the New Orleans Saints quarterback Drew Brees throws the football. There's a little discussion about whether or not Brees is more accurate than an Olympic archer, but what caught our eyes and ears was the spin rate of the football they estimate Brees gives the ball. 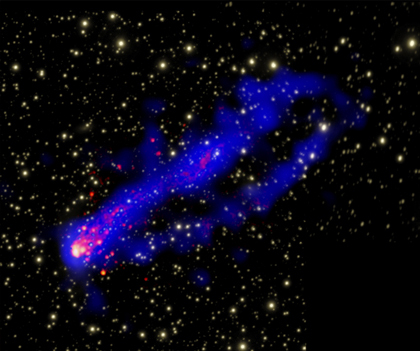 Two spectacular tails of X-ray emission has been seen trailing behind a galaxy using the Chandra X-ray Observatory. 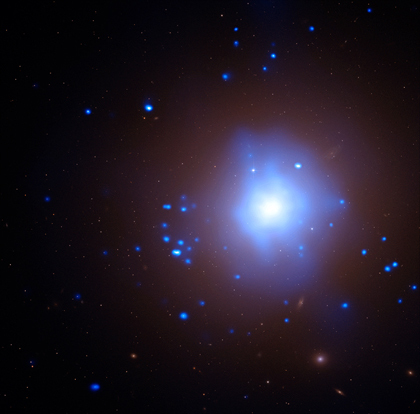 A composite image of the galaxy cluster Abell 3627 shows X-rays from Chandra in blue, optical emission in yellow and emission from hydrogen light -- known to astronomers as "H-alpha" -- in red. 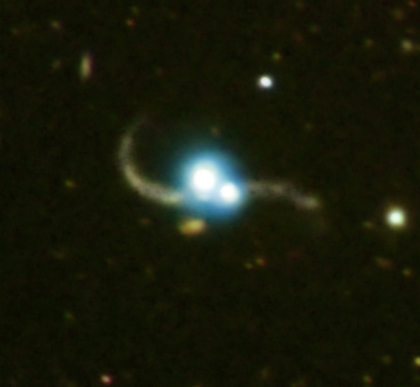 The optical and H-alpha data were obtained with the Southern Astrophysical Research (SOAR) Telescope in Chile. 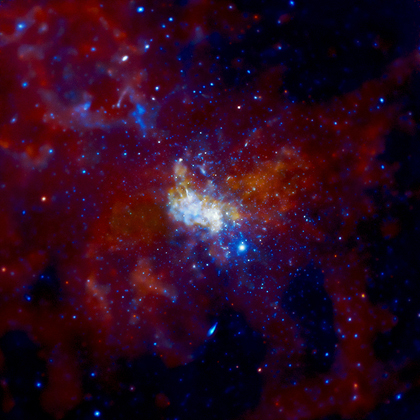 Q&A of the Day: If we lived inside a black hole, how would we know? How do we know that we â€“ and our Solar System â€“ don't live inside a black hole? Read more about Q&A of the Day: If we lived inside a black hole, how would we know? When we get to this point in the calendar, the "year in review of fill-in-the-blank" lists just come out in droves. You can't seem to drive to the mall without running over a "best of 2009" compendium of something or other. It's as if we have all had collective amnesia over the past 12 months and are required to be subjected to a crash review course of the year that was.